I love it when ads chime on about so called experts and how they are singing the praises of whatever product being offered like a barbershop quartet. 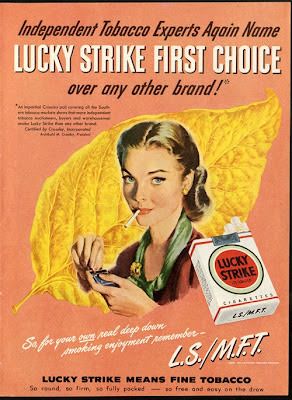 Of course these were the days before we were so cleverly informed by our government of the alleged dangers of smoking. All of the experts today agree like lemmings that smoking damages the health, but once again who are these experts? For the sake of the ad they were the members of the tobacco buying consortium in the South so of course they're going to sing the praises of tobacco. Lucky Strike differentiated themselves from the other cigarettes of the time period because they were made of 100% toasted burley tobacco rather than flue cured virginia. What does this mean in laymans terms? Burley has nutter slightly cocoa taste and a heavier nicotine kick while virginia tobacco is lighter and grassier with a new mown hay smell. Before you ask, I know all this from being a pipe smoker and having smoked both types of tobacco in their purest forms. Sadly it no longer matters which commercial brand of cigarette you buy today, they are all made from homogenized sheet tobacco that is essentially ground up stems and bits that are made into a paper and then sprayed with a mortifying amount of chemicals to make it taste like tobacco and burn quickly. Then the paper itself is subjected to more adulteration of chemicals. It's this stuff that truly makes cigarettes so dangerous. When I was in Alaska working this Summer, I switched from Pall Mall cigarettes to rolling my own using American Spirit tobacco. American Spirit prides themselves on producing 100% additive free natural tobacco and their line includes such variety as 100% US Grown tobacco, Perique Blend, and a 100% Organically Grown tobacco that is quite good. So round, so firm, so fully packed... So says the ad above (we're still talking about cigarettes right?). This is what a cigarette should be. It's interesting that since I switched to rolling my own I smoke less than before and gone is the urge to smoke, I do it when I want to and if I'm not able to then I'm not crawling the walls for lack of a cigarette. We talk at length about vintage era food that was non-adulterated, but we leave out tobacco because we have demonized it so. Maybe it's time to look past emotional disputes and look at what we can do to improve the quality of tobacco being offered to us.